Did you know that 300% more sales-qualified opportunities can be created through thoughtful and disciplined nurturing strategy? Did you also know that 80% of leads generated die and remain dead because sales does not believe they are “sales ready”? Prevent your warm sales opportunities from becoming cold and limping to the grave. 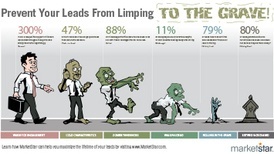 Take a look at our infographic to learn more about the importance of maximizing the lifetime of our leads.